Just saying hello.Looking to add an APBT to our family.Already have a Dutch shepherd,who came home with us from Amsterdam and a lovely mongrel boy we took in two weeks ago.I've always wanted an APBT and I know that one will fit in our family perfectly.I would want a pup as I have a 8 month old son and I'd like to train and socialise the dog myself from a young age.I've had dogs all my life so experience and the kniw how in how to treat dogs is not an issue.I'm from Limerick city and my name is Pacanto.Hope to get to know people on this forum! Thanks for the advice.I'm a sucker for Amstaffs too.Problem is finding a responsible breeder.I want a dog bred for being a pet,not a status symbol,if you know what I mean. Why are the APBT so hard to keep with other dogs?Surely if I get one at 8 weeks of age I can shape it and train it to be a social receptive well trained and well mannered member of the pack? They were bred for combat (to enjoy it and think independantly) not to be part of a pack and the majority today retain this instinct. And hence they can never be trusted not to fight when they become adult's especially not when unsupervised. I'm sorry but I simply don't agree that one breed of dog cannot be kept with another.That is just nonsense.Proper training and socialisation ensures that any breed can fit in with any pack. Listen to the advise your getting...ive 3 dogs.. one is a male apbt and he is 3 now..in the last year he has been seperated from the other 2 because fights started to happen..now there is no problem..he was raised from 7 weeks old with the other 2...its in them and no socialising will take it out..
socialisation ensures that any breed can fit in with any pack. Proper training and socialisation cannot ensure instinct won't come to the surface. Sadly I know of to many incidemt's (I don't call them accident's) which resulted in death or at worse very serious injury, all because well meaning ignorant stupid people thought these dog's are like other dog's and can be raised as part of a pack. These dog's can be raised alongside other dog's but not as part of the pack since they have to be kept seperate when you leave them alone. If your not prepared or willing to go that extra mile then these aint the dog for you. I appreciate all advice i get.Especially from those with plenty of experience.Understand,I want this dog as a pet and as part of our family and pack and if an Amstaff is the way to go so be it. I refuse to listen to those who try and tell me a pitbull or any other breed will bite or be aggressive because they were bred that way.In my opinion,that is sheer nonsense. Why not?Are they the devil dogs they are made out to be?You're telling me that an APBT can in no possible way become part of a family? That surely cannot be the way with every APBT! You're speaking from experience i presume?If so I take full heed of your advice.My next dog tho is another Dutch Shepherd or a Belgian Malanois.I'm going back to Holland for one.We have a Dutch.Shepherd,amazing intelligent loyal and loving dog.Need to be exercised daily and training is non stop but thr rewards are amazing.Amstaff was never out of the question,neither was an American Bulldog.Any opinion on either breed? You have a young baby if we were concerned about human aggresion don't you think we would have mentioned it? We didn't because it's extremly rare that the Apbt is HA aggresive when one is it generally get's PTS (no second chances) as this is not an acceptable trait in the breed. We are concerned that if you do get an Apbt that you understand and are prepared and resposible to do what is right for your other dog's and keep them seperated when left alone. It's to save you and your family the heart break many well meaning people have suffered when they ignored such advice. 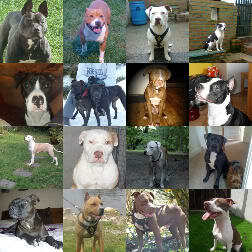 Any responsible Amstaff/Staff breeder will advise you to keep em seperated when you go out. Never yet seen any Ambull I'd trust. A friend of mine breed's and train's Belgium shepherd's (all varieties) and he won't sell one to anyone with kid's because of their HA tendancies. I look after them when he goes on holiday. Fact is most breeders of any breed's will advise you to keep no more than two dog's together in case a fight starts and two gang up on the other. I take ye're point about the APBT and appreciate it.Any opinions on an American Bulldog or an Amstaff? If I was worried about human aggression I wouldn't bother with any dog in the first place.Ye seem to think I'm some sort of fool who locks his dogs out the back and feeds them a can of pedigree chum once a day.I have years of experience with Dutch Shepherds and Mals.Its not through sheer luck I've kept these for years without any incident.I put hours into my dogs every single day and the results show.I'm here looking for opinions about bull breeds such as theAPBT, the Amstaff and the American bulldog.The only reply I seem to be getting is that they will be aggressive.They won't.I'll make sure of it.